From the early days of D-Premier through to the present, Expert systems have been designed for optimal scalability and adaptability. This is what makes them so unique to Devialet: a commitment to fighting planned obsolescence. Core Infinity opens up new possibilities for Expert Pro, bringing you a new era of music streaming as it unfolds. Whatever audiophile player or online music service you're using, the different streaming protocols embedded in Core Infinity allow you to enjoy them fully and simply on your Expert Pro. Featuring the latest Devialet OS and equipped with future-proof computing power, Core Infinity is built for long-lasting performance. 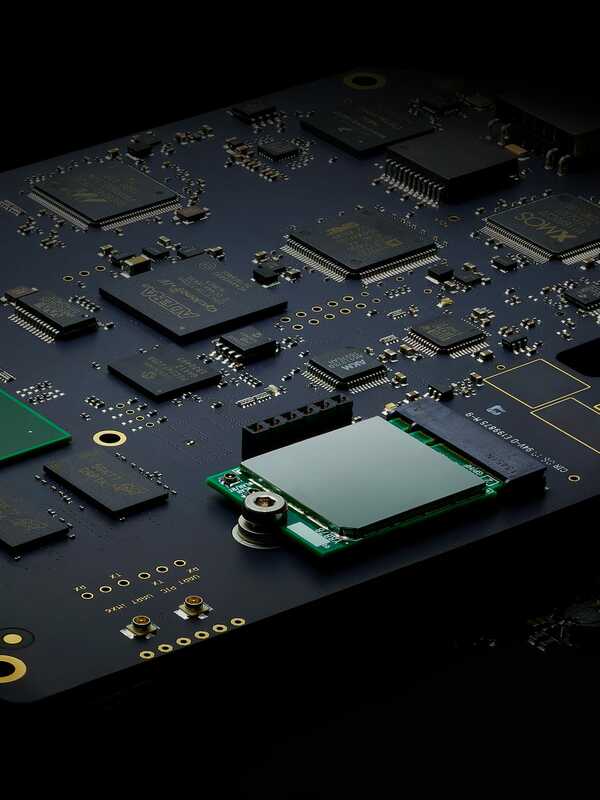 The board comes with a Quadcore ARM processor clocked at 1GHz, supported by 1GB of RAM-DDR3 memory and 4GB of Flash memory. - An FPGA specifically intended to provide extra computing power to Devialet OS, optimize audio signal routing and rework clock distribution for minimal digital jitter. The gain in audio quality is substantial. - A second audio DSP (Digital Signal Processor) providing additional headroom on top of the DSP already included in the mother board so as to support future signal processing features. - 3 ASRC (Asynchronous Sample Rate Converters) to leave ample room for future developments, and in particular compatibility with additional sources. - An improved USB interface tailored to accommodate future audio formats. Core Infinity opens Expert Pro to the world of music streaming, bringing you a variety of leading streaming protocols. Used as an UPnP renderer, your Expert Pro can stream music from any UPnP-compatible app, up to 24bits / 192kHz. AirPlay® lets you stream your favorite online music in CD quality from any iOS or Mac OS-enabled device, or via iTunes on Windows-based computers and tablets. Spotify Connect gives you the freedom to enjoy your Spotify Premium membership on Expert Pro, with bespoke volume control integration and automatic wake-up function. Finally, our Devialet-patented AIR® technology transforms your Expert Pro into a virtual soundcard output for your favorite audiophile player, with up to 24bits / 192kHz streaming in bit-perfect mode. Upcoming Bluetooth capabilities for Core Infinity will help make Expert Pro even more open and universal in the future. Native integration of our exclusive Devialet AIR® technology with Roon means you can now enjoy the world’s most advanced audiophile player with Expert Pro. With the integration of RAAT (Roon Advanced Audio Transport) to Devialet OS in progress, you’ll soon be able to stream in multiroom and bit-perfect mode bewteen your Expert Pro and any other Roon Ready devices.